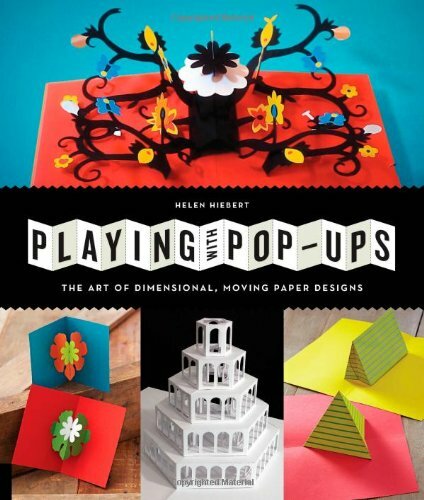 Playing with Pop-ups by author Helen Hiebert is an activity book on creating pop-ups. It's a beginners book that goes through the basic techniques of creating cuts and folds. The instructions are clear and simple to follow. The book starts off with the materials required and then proceeds on quickly to the 20 hands-on projects. The designs of the pop ups are included in the book with instructions to photocopy them into different sizes. You don't want to cut the pages off from this beautiful book. The pop-up designs are also available for download on the publisher Quarry Books website. The first five are elementary projects to start you off. The next 15 are more interesting and you can create pop-up subjects like city skyline, robot, dragon, carousel book, and more. Some are quite elaborate designs requiring many cuts, folds and gluing. The end result is often delightful and charming, such as the recreation of an interior room, or a volvelle (a rotating paper mechanism). The last chapter features a gallery of artworks from paper engineers and artists. 25 are featured and the works are wonderful and inspiring. Highly recommended to pop-up beginners.